Let’s be honest. Most Christians have a hard time praying, at least to the extent that they feel they should. I often feel that people think God is McDonald’s in the sky. We would like prayer to be like putting in our order at McDonald’s, expecting an immediate answer. In the last Langstaff Letter, we addressed the question, ‘How hard do we have to pray?’ One of the main points I discussed was that if prayer is ‘Hammering on heaven’s door, then it is for our benefit, not God’s.’ In other words, it is not that God is a reluctant father (see Luke 11), but rather He is using our persistence in prayer to do a work in us that prepares us for all God wants to do through us. Now, let me give you some further ideas of what this involves. John Matthews of Scarlet Thread Ministries has had a wonderful ministry in the Ukraine over many years that has required must travel from Minnesota and consequently the funds for airline tickets. He has never had a personal source of funds for these trips and has had to believe God, at times right down to the last minute. Here is one of his stories which reminds me of similar adventures my wife Dorothy and I have had. One of our many trips to Ukraine included both of us, our daughter Jen, her friend Scott (now her husband), and her Lithuanian friend Olga. As usual, none of us had travel money for the trip. It started with the still small voice in our hearts that we were to go as a team to Ukraine. We prayed together regularly and made the plan several months before departure. None of us knew where the money would come from for the travel. Now, the final date for payment was getting near. We had to pay the travel agent $5,000 for our five tickets, or we would lose the seats, and no other seats were available in that time frame. By this time, I was quite upset in my natural mind and emotions. I knew if I had missed God, Jackie and I would be ok, but we had three young adults on our little team who didn’t need a disappointment in their faith. The hours marched on. Tuesday morning arrived. 2:00 p.m. that day was the deadline. NO money had arrived. My heart still said we would go. My mind and emotions were not feeling good at all. I ‘felt’ not faith. I asked the Lord to help me remember my feelings and thoughts at that time so that I could remember what it feels like just before a miracle. Actually, I felt somewhat sick. My stomach was in knots. I often ask people, ‘Who loves miracles?’ Everyone raises their hands. Then I ask, ‘Who loves the circumstances where you NEED a miracle?’ People are slow to respond to that. It doesn’t feel good when you need a miracle. It doesn’t look good. And your natural mind may scream many things at you. Well, 10 a.m. arrived. Then 11 a.m. arrived. Nothing. Then 12 p.m. noon. Nothing. Then 1 p.m. arrived . . . .
At 1 p.m., the mailman delivered an envelope. I saw it was from a dear lady what sent us a small offering of a few dollars every three months or so. It was a check for $5,000. I thought she had meant to write a check for $5. I had one hour till the deadline to pay for our air tickets. I went to the bank and deposited it, and entered the office of the travel agent at 1:55 p.m., five minutes before our reservations would automatically disappear from the airline’s records. I left with our five tickets to Ukraine. Paul, the great apostle and missionary leader, had important things to say about spiritual warfare in Ephesians (Chapter 6:10-20). He talks about the armor of God and declares, ‘Stand therefore.’ He details the armor of God, the belt of truth, the breastplate of righteousness, preparation of the gospel of peace on our feet, the shield of faith, the helmet of salvation and the sword of the spirit. We are to pray and not just a short little prayer, but a strong powerful anointed Holy Ghost prayer that will break down spiritual barriers. Pat Robertson of the 700 Club in his book ‘The Secret Kingdom’ writes, Some Christians have been taught that all one has to do to get things from God is to speak the word of faith, believe, and receive. That comes close to the truth, but it neglects the universal Law of Perseverance. God slowly yields the good things of the kingdom and the world to those who struggle. Jacob, for instance, wrestled all night with an angel before he became Isreal, a prince with God. Abraham waited one hundred years before he received Isaac, the child of promise. The people of Judah waited and struggled seventy years in captivity before God brought them home. The baby chick, approaching full life, finds himself in a nice safe environment, dark and quiet. His home, the egg, keeps him warm and cuddly; he feels just perfect. Soon, however, he becomes aware that the shell keeping him so comfortable and safe is also circumscribing his life. He begins to feel restricted. You see, there is something in life that say, ‘I have to grow.’ Humans and animals have planted within them the need to be free and to grow. So the little chick begins pecking at the shell. He doesn’t understand it, but things have been set up so that he has to peck and peck and peck. He works very hard, gaining strength hour by hour from that God ordained struggle. Before long, he has attained the strength and endurance to cope with a new environment, and he breaks through the shell. He pecks some more, and soon he is free, ready for a new level of life. People have tried to help little chicks speed the process by cracking the shell and opening it for them. But, short-circuiting God’s process, they kill the chicks. They are still born, unable to handle even a few moments the rigors of the new environment. God’s principle is what I call the Law of Perseverance. It is critical to success in life generally and to life in the Kingdom especially. Jesus told us that man ought always to pray and not lose heart (Luke 18:1). The Bible has many examples of ‘praying hard.’ i.e. 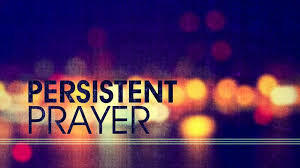 persistent prayer. Let me mention just a few. •Nehemiah had prayed for some 100 days before he was released to pursue his vision to rebuild the wall of Jerusalem. •Elijah prayed seven times to see the drought end in Israel until eventually, his servant reported that there was a cloud the size of a man’s hand. •Jesus, even Jesus, persevered in prayer in the Garden of Gethsemane, prior to his death on the cross. What are you facing right now? Don’t give up. Keep asking, keep seeking, keeping knocking, knowing that you will receive, you will find and the door will be opened to you. Perseverance in prayer will give you victory.